This is probably the ultimate luxury one can get when money is no object! 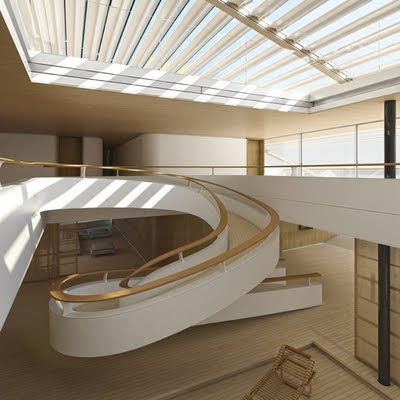 The "WHY Wally-Hermès Yachts" is the new company created by french luxury brand Hermès and monaco based yacht maker Wally, dedicated to a new lifestyle of living on the sea. Click on the media player below to experience the magic ! designing a boat with a new concept is not an utopia. 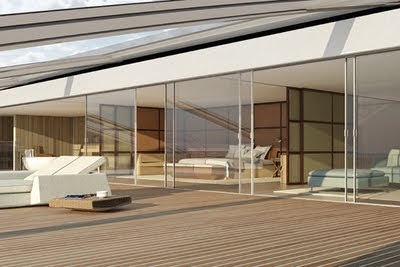 at every turn the yacht offers maximum space, durability and cutting-edge technologies. the exchange with Wally and Hermès was rooted deeply in terms of know how and sharingthe same philosophy of this new concept. Hermès was involved in every step of the process from concept to realization, consideringboth the outside and inside were just one of the many things. as always just like with alltheir designs they paid special attention to detail, developing the overall architecture of the vessel evaluating issues of speed and spaciousness. the boat is contained in a triangular hull measuring 58m x 38m. there is no superstructure. 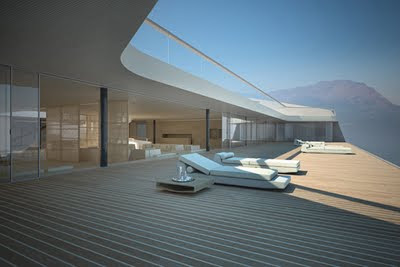 the initial idea of this hull was confirmed by the ramform hull which they discovered, redesigned and adapted to fit the concept of the wheel house that emerges from the silhouetteof the ship. the interior of the yacht is fitted out with water resistant buffalo leather usingthe calpinage technique. 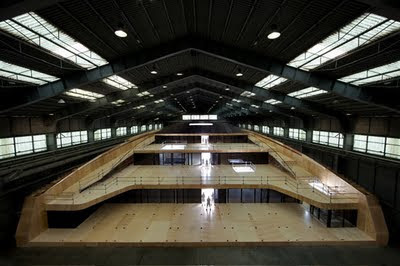 The yacht which took years in the making has been tested in gotebourg, sweden,in a specialised tank testing facility, to see how it would perform in big seas. the outcome is that, in full swell, the bow moves a tiny bit and the stern stays completely still. anchored, the boat creates a totally flat surface behind it, like an olympic-size pool where you can swim in total peace. on the bow, there’s a seawater pool 25 metres long that follows the curve of the bow. The environmental and ecological advantages are a strong point of the boat WHY.different sources of energy are managed by a central computer. 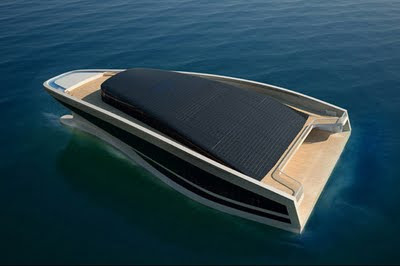 The yacht is powered using a diesel electric engine. a surface of the photovolaticpanels which measure approximately 900 square meters provide the solar electricitygenerated which covers part of what is needed to subsist the boat. 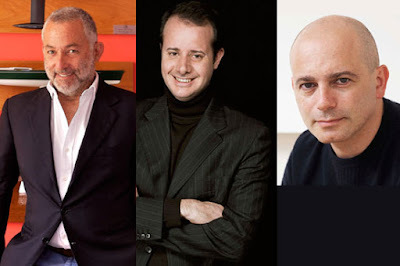 The concept was developed by president and CEO of Wally luca bassani antivari, artistic director of Hermès, pierre-alexis dumas and design director of Hermès gabriele pezzini. So did they came up with the idea of building this yacht? pierre-alexis dumas says "my inspiration is still the greek caïque, roomy, generous and slow. this eulogy to slowness is demonstrated in such a magnificent way. a pared-down craft with nothing superfluous about it. we needed a stable hull in orderto hold the sea comfortably. the idea of a triangular hull, which doesn’t exist in the worldof leisure boating, came from the utilitarian merchant marine." and luca bassani antivari syas: "I came across a picture of a supertanker while reading a professionalmagazine. a cable-handling vessel, used in the geo-mining and seismological industry in the north sea, invented by a norwegian naval engineer, roar ramde, and fully patented. there was nothing new about this ship. it had been in use for twenty-five years. as soon as I saw it, I picked up the phone and called my consultant naval architect, mauro sculli. 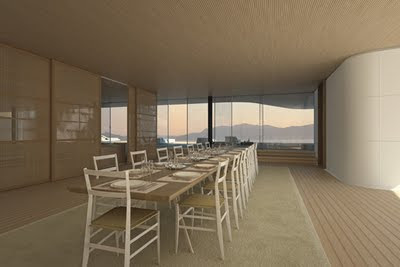 he looked in the RINA, the italian naval classification registry: never seen or heardof before in the world of yachting! it was perfect. we had our hull. we bought exclusive rightsto the concept, patented strictly for yachting." 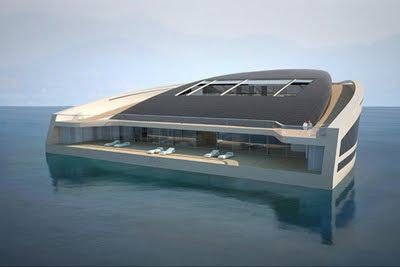 So you must wonder did this new territory , a "Floating island" require them to come up with a new way to design a boat ? Pierre-alexis Dumas says: WHY addresses the very real problem of consumption, which is today exacerbated by the global context. we provide an answer in a field where clients are responsible for setting an example, embracing a new ethic. what this market needs isa boat designed with the environment in mind. this new way of moving on water must giveway to a new way of managing energy, its sources and uses, how to recycle it, etc. 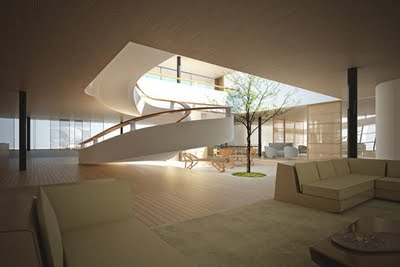 the same goes for the choice of materials; we have to limit the effect on the environment. 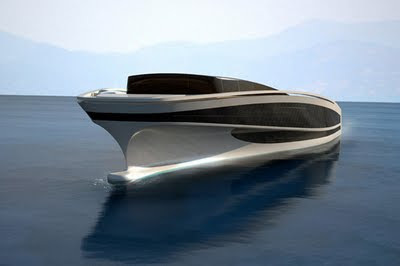 Gabriele Pezzini says: we didn’t design a boat, we gave shape to an idea. the sea is one of the lastspaces where people can indulge in absolute freedom. deciding to live on the sea means rethinking everything that’s been done before. you need to start from scratch! 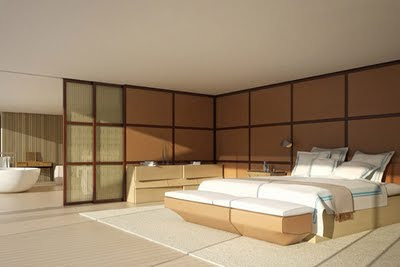 for example,we provide a real jogging track inspired by coastal paths running around the ship. above all, we had to transpose and translate functions into forms, and vice versa, by mergingthe viewpoints of Hermès and Wally. and for all of your "eco-friendly" people out there, this fabulous Hermes Yachts is totally enviromental & ecological friendly !! Pierre-Alexis Dumas says: ours requires less power at cruising speed than a boat of equal size. its diesel-electric motorisation is the most efficient motorisation out there today, and the surface of the photovoltaic panels, almost 900 square metres, covers part of what’sneeded to subsist on the boat! we’re also looking into a telescopic wind-turbine system and a retractable mast with a computer-operated sail measuring over 200 square metresthat will produce at least 30 % of the energy used to propel the boat. Here is another video of this fabulous "Floating Island" !! Untill next time, champagne wishes and caviar dreams my friends !! Dior Granville Satchel Tote Is a Must Have Bag !